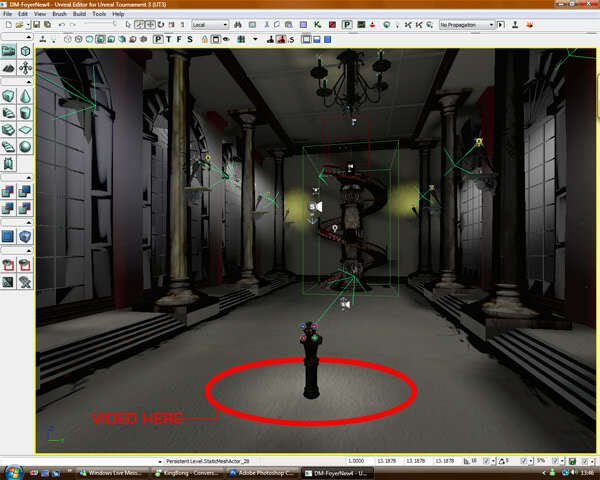 A tutorial looking at converting video files so that they work within the Unreal 3 engine. 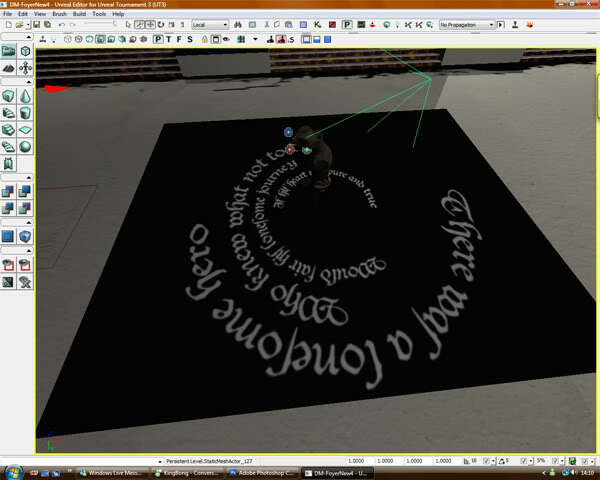 For this tutorial I’m going to show you how I imported the Foyer text from GhostWriter. Here is a movie rendered from 3DSMax. I want this video to be placed into Unreal so we have to convert it into a .bik file using the RAD Video Tools. Open up the RAD Video Tools from under ‘Bink and Smacker’ in the start menu. Next select your video file from it’s location and click on the ‘Bink it’ button. I usually leave the settings as they are as I haven’t had a good look at what each setting does. The outcome however is fine though. So next click the Bink button. 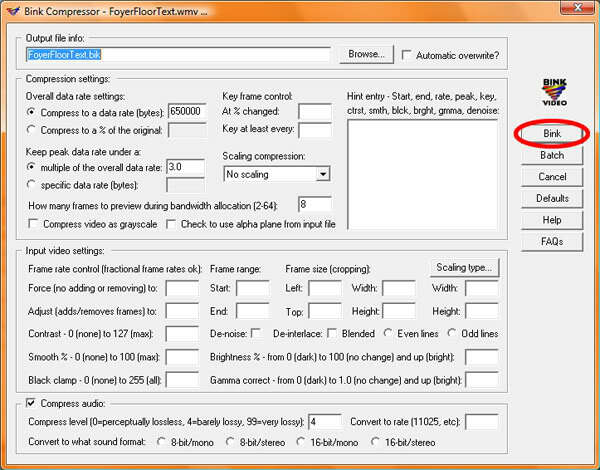 Once it has finished compressing, click on ‘done’ and close RAD Video Tools. 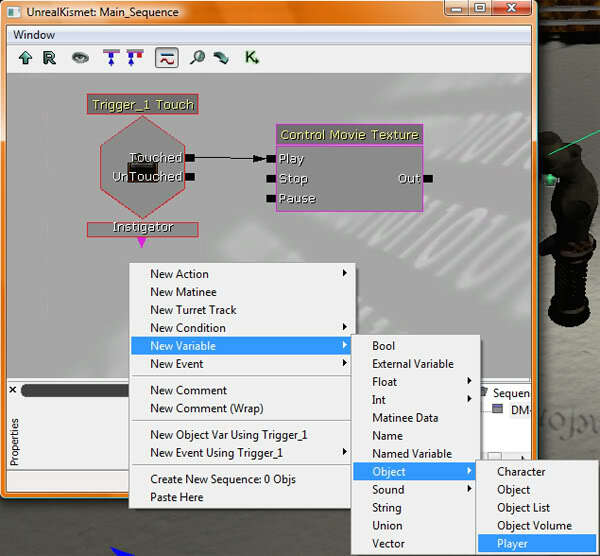 Next open the Unreal Editor and your map that you want to import the video into. This map is the Foyer for GhostWriter and the video I have just compressed needs to go here. 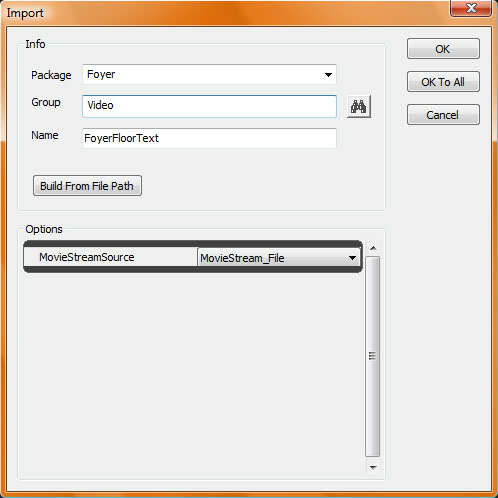 To import the video we go to the generic browser( ) and select file – import. 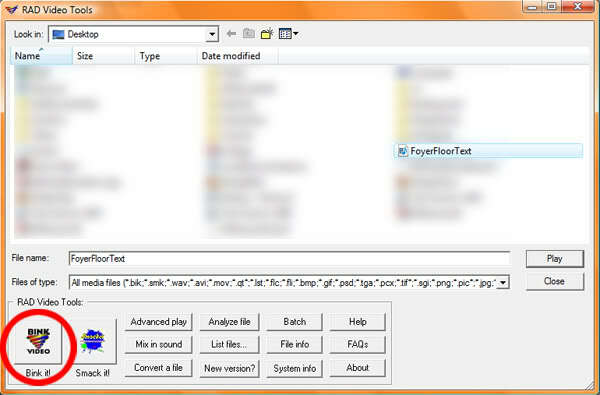 Your video/bik file should now be selectable. Select it and click open. Name your package appropriately and click on OK.
Now it should be viewable in the generic browser under your package name. Don’t forget to save! To actually use it in the level, we need to make a material. So right click in the generic browser and select ‘New Material’. This should open a new window. 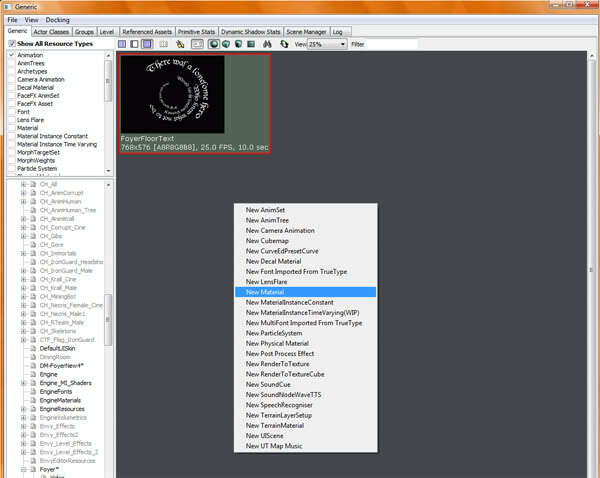 With the video selected in the generic browser, click and drag ‘texture sample’ onto the grey area in the new window. Your video should now appear. The material is applied to a plane mesh. 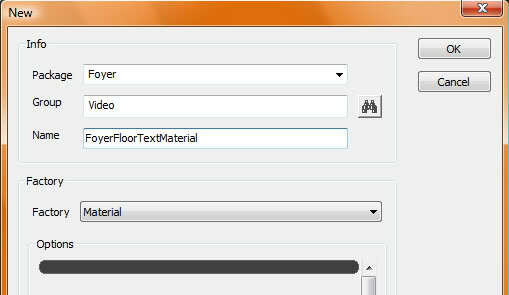 Obviously I don’t want the text to look like this (it should look like the text is on the paper floor). So now I have to give the material opacity properties. I’ve imported a black 128x128 texture. 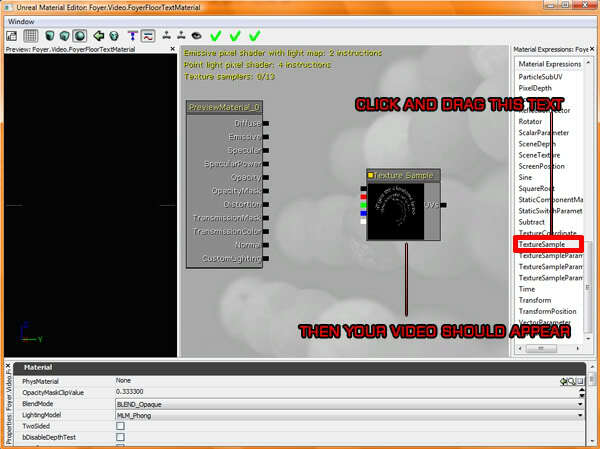 I’ve added this to the diffuse channel and changed the video texture to the opacity channel. 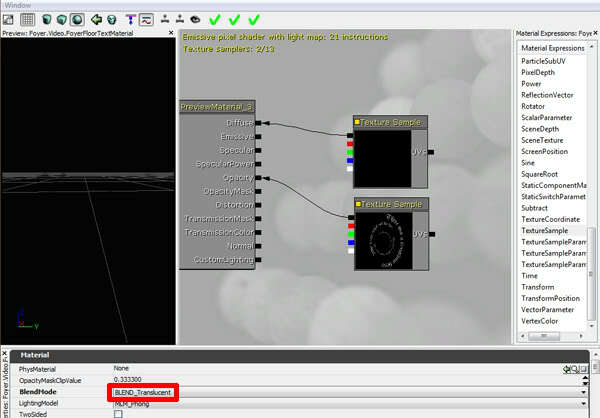 Finally I need to change the blend mode to ‘BLEND_Translucent’. The material is now ready (after saving the changes of course). The material should up date in the game itself. Obviously, you may not need to add an opacity map depending on the video you are using. Here is the final outcome in game. Controlling when the video is played. If you are using a video that you want to start at a certain time (by the activation of a trigger) you can use Kismet to control it. Say I want the movie to start only when this trigger is touched, I would select the trigger, open Kismet ( ) - right click in the grey area and select 'NewEvent Using Trigger-1' - touch. Next, right click again and select, new action - cinematic - control movie texture. 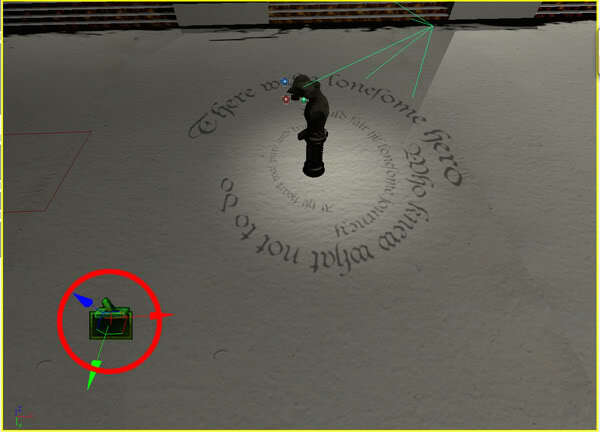 Select the 'Control Movie Texture' box and click the small arrow next to 'Movie Texture' (make sure the movie is selected in the generic browser first). Your video name should now appear in the box. 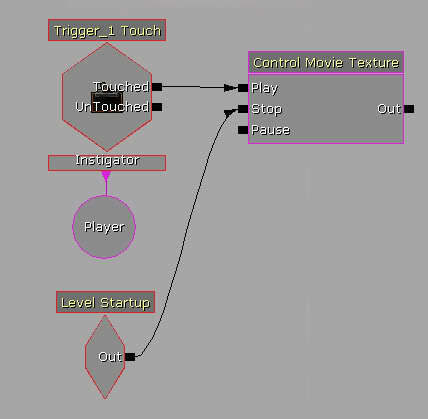 Next, link the 'touched' channel of the trigger box to the 'play' channel of the movie box. We also need to set the instigator. 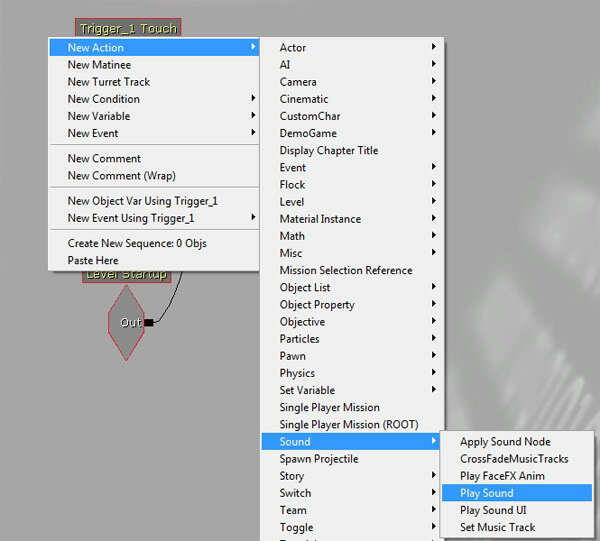 So, right click - new variable - object - player. 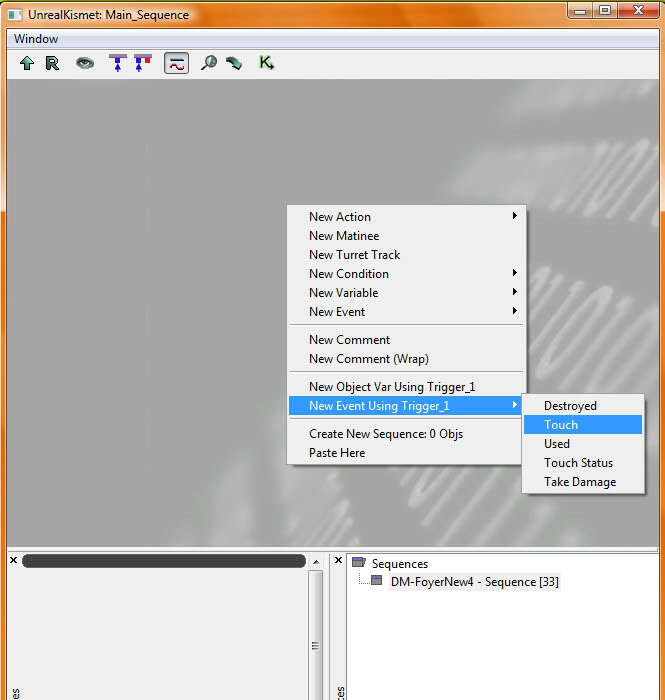 Connect the instigator channel to the player variable that is now shown. Finally, we need to tell Kismet not to play the movie when the level starts, so right click again - new event - level startup. Link the 'out' channel to the stop channel of the movie box. And that's it! The movie should not start until the player touches the trigger. What's that I here you say, 'What if I have sound in my video!'. 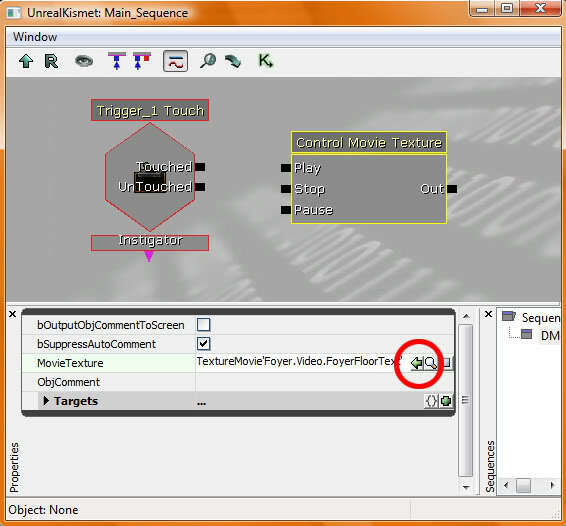 Well then, when the trigger is touched, you would also have to add a play sound function to the Kismet. Link the channels to their required locations, add the sound to the sound box and that should be it. You could also set up cameras so that the video is full screen. They could then act as cutscenes. You would have to lock the player controls during this. If anyone would like to be shown how to do this please feel free to contact me. 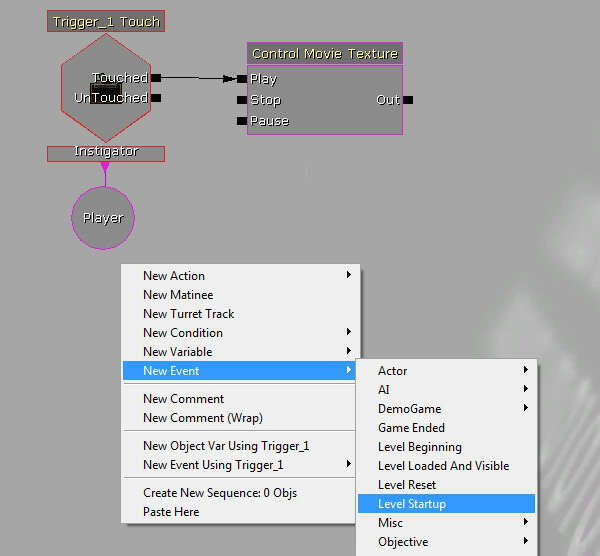 I have simply posted this tutorial to share my knowledge of the Unreal Editor and so that the modding community have a resource in this certain area. There may be a million different ways of carrying out the task but this is the way I do it, and it works! No problem, thanks for checking it out! Yeah I have seen the rotator function but I thought it may take longer doing it that way. I was pretty confident it would work the way I did it, so I just went for it. Awesome Matt! Your doin' good. Simple and important tutorial, thanks a lot! Unfortunately, it doesn't seem to work so easy for me. The movie gets totally dis-scaled when on a surface. Only if I fill a whole cylinder with it, the top face will show it in the middle. Has this to do with my clip resolution 480x272 or any other cause I need to check? hey matt_barry? that was some really cool ****! very nice job man!! !